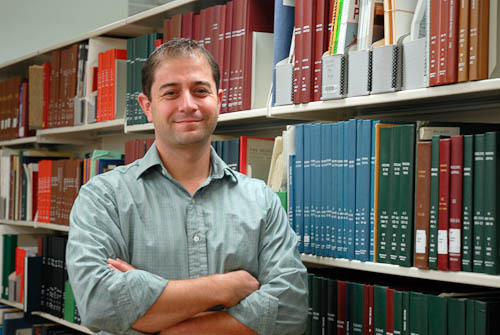 Hailing from Babylon, New York, Dave Opkins is the Smithsonian Libraries’ new Administrative Project Specialist. Dave joins the Libraries from the Freer and Sackler Galleries’ Office of Design, Publications and Web, where he previously worked as an office administrator. He earned a bachelor’s of business administration from George Washington University in 2000. In his new post, Dave will oversee projects in finance, accounting and contract management for the Libraries. His goal is to provide good service for staff who rely on the Administrative Office, with a focus on dependability, accurate information and easy interactions. Dave found his love for museums as a young child, when he and his father made an annual trip to New York City to visit the American Museum of Natural History. He plans to have a long career growing within the Smithsonian; he describes working for the Institution as a personal interest to being part of something great. Dave enjoys being with his wife and daughter, spending time outdoors and renovating his house on Capitol Hill. Next Post Art & Science: Twins Separated at Birth?